Do Darwin Differently! 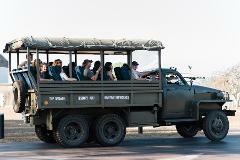 Explore Darwin from the back of a comfortably restored WW2 truck! Discover Darwin's rich history.Visit sites bombed by the Japanese in WW2. See the effects of Cyclone Tracy. See it! Learn about it! Discover it! Do Darwin Differently Charter our historic vehicle for 5 hours and you decide which attractions you want to see! Visit Crocodylus Park, feed some Barra, visit museums, the choice is yours! Minimum 10 adults or seniors required per booking.